We know that peer support is a very useful tool in terms of mental health. We know that as adults we will often speak to a friend to share a problem or let them know how we are feeling. Women still tend to be better at doing this than men, however, there have been a number of high profile campaigns recently to encourage boys and men to talk and to know it is ok not to be ok! At Stanley Grove Primary Academy, the student ambassadors there have encouraged more children to do the Daily Mile as part of their wellbeing work than ever before! They took part in the GM Daily Mile Birthday celebrations in March to share with other schools just how powerful physical activity is in terms of feeling well! Finally, at Altrincham Grammar School for Girls the wellbeing ambassadors who formed as a group four years ago set themselves a target to improve the way school manages the emotional health and wellbeing of students. They have worked hard to reduce the stigma in this area and felt very strongly that students struggle to self-assess their own level of mental health. They have led some brilliant projects, such as exploring common stress triggers, and have come up with helpful tips and strategies for each year group. They also designed a mental health flowchart ‘The Guide to a Healthy Mind’. It incorporates a fun quiz, containing questions they devised with the in-house BFET educational psychologists. 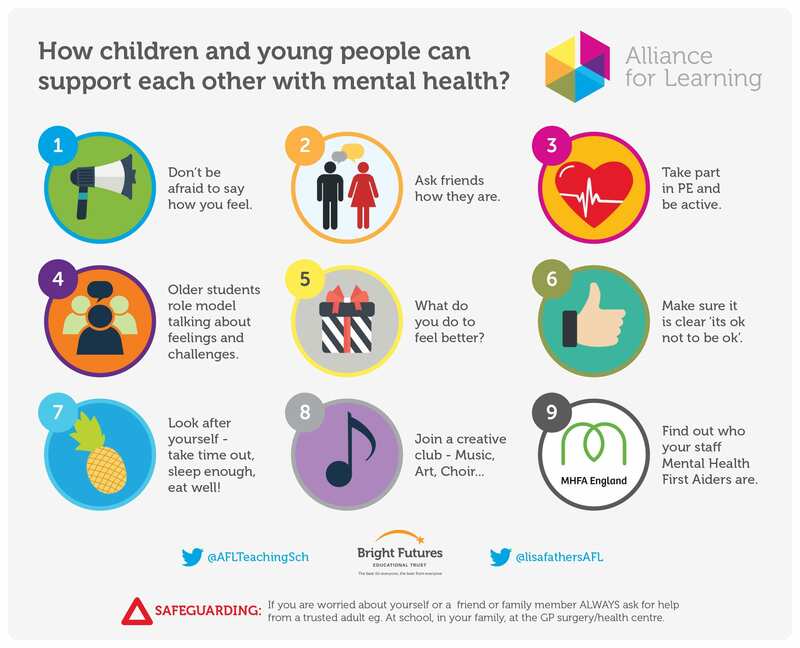 These questions determine the student’s level of mental health and at the end of the quiz there is information about how the individual can improve their wellbeing. In addition, there is a list of services available in and outside of school, tailored to each level of mental health. The flow chart can be found in every student’s planner, and on our school website.